ANGIOLINI; Mrs ANGIOLINI; Brian ADAMS MSP; MSP; Procurator Fiscal; « HOLLIE GREIG etc. The Procurator Fiscal, Mrs. Angiolini. 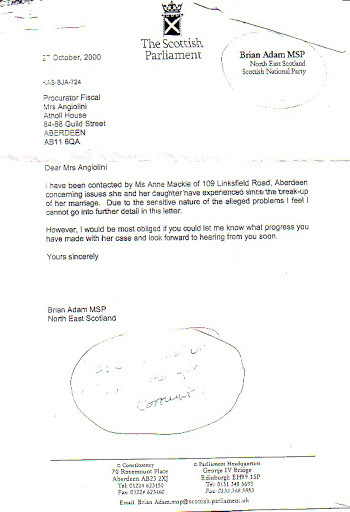 I have been contacted by Mrs. Anne MacKie of 109 Linksfield Road, Aberdeen concerning issues she and her daughter have experienced since the break-up of her marriage. Due to the sensitive nature of the alleged problems I feel I cannot go into further detail in this letter. However, I would be most obliged if you could let me know what progress you have made with her case and look forward to hearing from you soon. Double click picture to view.